Maryhill Ladies Athletic Club will almost certainly be the only women’s club to be included in the ‘Fast Pack’ page. It was a brand new club that came from nowhere to be British Women’s Cross-Country champions in less than five years. With brand new coaches who were inexperienced at this level of athletics and good but not outstanding runners they are worthy of comparison with any club, male or female. It is unfortunate that there has been so little written about the women’s scene in Scotland and no standard reference work and any further information received would be more than welcome. Maryhill Ladies Athletic Club appeared quite suddenly on the athletics scene in Scotland. It was at a time when there were several very good women’s clubs in and around Glasgow. There were Maryhill Harries Ladies, Bellahouston Harriers Ladies, Springburn Ladies, Clydesdale Harriers and several others but although they all had very good athletes no one club was big enough to challenge on the British stage. 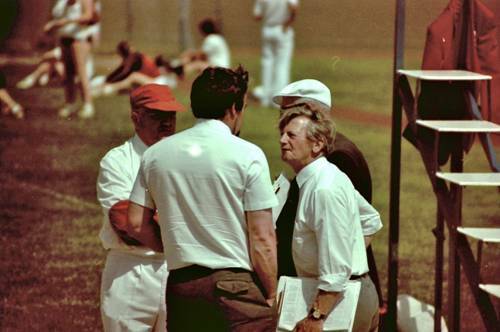 John Anderson was a member and coach at Maryhill Harriers Ladies which, despite its name, really had no connection with Maryhill Harriers and it was run by Tom Williamson and his wife. In 1961 Tom decided to set up a club that united all the best women athletes in the area which would be good across al disciplines and able to challenge the very best. The decision upset all the clubs from whom the new club’s members came but at Maryhill after he left there was some confusion about what to do next and John Anderson was asked to re-organise the club. Despite having no real first-hand experience of athletics or proper coaching, he agreed to do so. The new club was set up with the name of Maryhill Ladies AAC. How did the club become so successful? More about that question at the end but back in 1961 John set about recruiting coaches for the club, started to read all he could about the various disciplines and got the ball rolling. They had to have some goals – the first was to be the best club in Scotland after three years, the second to be the best club in Britain after five. 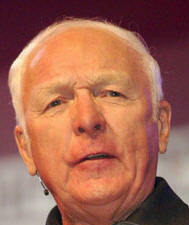 John is keen to give credit to two club members in particular who were, in his words, ‘central to all that followed’. They were Marlyon Page (nee Black) and Gill McDonald (nee Stead). Marlyon was a good club athlete with best times for 220y, 440y and 880y of 26.6, 61.0 and 2:20.2, and Gill had bests of 28.0 (220y), 13.5 (80mH), 3457 points (Pentathlon), 9.89m (Shot), 31.19m (Javelin), 5.18 (Long Jump). Gill was second in the SWAAA javelin in 1961, and 3rd in the long jump in 1960, while Marlyon’s best 880y time saw her fourth in Scotland in 1961. They were invaluable in league competitions but they were at least as valuable in the club’s organisation filling all the important posts, keeping everyone up to date, getting forms in on time and so on. John is quite clear about that. It had been decided that, in line with sound common sense and athletics principles, that before going to the British Championships, they would take a team down to England to check out the lay of the land, to give the runners a feel for the event and make their presence as a team known. The rules allowed eight to run and four to count but the club hadn’t that strength in depth at that point in their development, so they had the bare minimum of four runners and all had to finish. The four were Margaret Crawford, Leslie Watson, Isabel Inwood and Marlyon Page and they set off on the journey south. After they crossed the border, there was a snow storm, it was impossible to continue and they decided to park the minivan at the side of the road. John thought he’d ‘be a great hero‘ and sleep under the van giving the girls the comfort of the interior. Under he went with his sleeping-bag but unfortunately, or perhaps inevitably, he couldn’t sleep and in the middle of the night he was so cold that he knocked on the door and asked if he could come in. There was no problem with that, far from pyjamas and nighties the girls had coats on – in fact the suggestion was made that perhaps they had 47 layers of clothing on! They eventually dozed off for a bit and in the morning the van was stuck in the snow so Leslie and Cathie jogged off looking for a village or somewhere that they could get help. They came back with a farmer and a tractor! The van was thawed out, the tractor got them back on the road and they headed off south for the championships, still very cold. It was then that John saw a queue and realised that it was for the cinema. “OK, girls. We’re going to the pictures!” “But we can’t, we’re racing this afternoon!” “You’re not going to the pictures to see the film. There will be heaters along every wall inside.” So John paid for them all to go to the cinema. Eventually, thoroughly warmed, they made their way in the van to the venue and ran in the race where John had given them instructions to run as a team so that they would be seen and known in future. Leslie however, not usually the first finisher for the club finished well up the field in approximately tenth position with the others further down the field finishing as a trio. Leslie apologised to John for not doing what she was told! Apparently she had slipped at the first gate and when she got up, couldn’t see the others so just raced as hard as she could to try to catch them up! However, in the British Championships the team race was won by Bury and Radcliffe AC with 51 points from London Olympiades on 70 and Mitcham with 86 points. Very close – but it would be less close in the following two years! This was all leading up to a marvellous two years. In 1965 and 1966 Maryhill Ladies Athletic Club did something that no Scottish club had done before and none have done since when they won the British Women’s Cross-Country Championship. In 1964-’65 the season started with races organised by Tannahill Harriers in Giffnock: in the handicap race, Margaret Crawford won from clubmate Marlyon Page. In the club own open event at Nether Pollock on 12th December, Isabel Inwood (running for Glasgow Police) won from Cathie Kelly with Dale Greig third. On December 19th, in the Scottish Women’s Christmas Handicap races at Garscadden, Cathie Kelly had second fastest time behind Georgena Buchanan of Western LAC. On 9th January in the Scottish Women’s Cross-Country Union Senior race from the Maryhill LAC headquarters Cathie Kelly was again second to Georgena Buchanan. More races are being reported now in the run-up to the Scottish Championships and on 16th January in the Greenock Rankin Park ballot team relay at Greenock,, the fastest time was by Georgena Buchanan (9:09), second fastest was I Inwood (9:14), fourth C Kelly, fifth L Watson (9:33) and fifth M Crawford (9:55). The Ballot team format involves all the individual entries being seeded into three piles according to the ability of the runners and one drawn from each pile to make a team. The intention is to have mixed teams so that runners whose club teams are not doing so well or who do not have teams, have the opportunity to pick up a prize. There is no doubt that had it been a club relay, Maryhill would have won. On January 23rd, Maryhill LAC held their women’s winter open races were held at Nether Pollock with the result that G Buchanan won in 23:23, C Kelly was second in 24:12 with L Watson third in 24:27. On 6th February, the Kilmarnock cross-country handicap races with the two fastest times run by members of Maryhill – M Crawford being first and C Kelly second. The next race was the big one – the SWCCU championships. 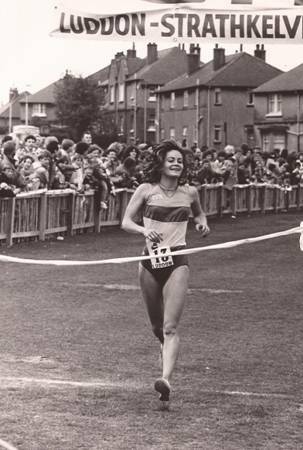 In the Scottish championships, the team had four runners in the first six, Watson, Kelly, Crawford and Inwood, and one of the other two was a former Maryhill LAC runner – the winner, Georgena Buchanan. They won by 11 points to 30 for Greenock Wellpark. Two weeks later they raced at Fernieside in a Glasgow v Rest of Scotland match and their runners finished fourth and fifth (Watson and Crawford). The British championship was on 13th March, 1965, and the ‘Glasgow Herald’ headline shouted out British Title Victory For Maryhill Harriers’ (they meant Maryhill Ladies AC, of course). The report read: “Maryhill Harriers ladies team had a splendid victory in the in the English cross-country championships over a heavy course (three and three-quarter miles) on Saturday at Birmingham. When their four counting runners finished in the first 27 places. Miss L Watson was fifteenth, Miss C Kelly twentieth, Miss C Campbell twenty sixth and I Inwood twenty seventh which gave the club an unassailable total of 88 points. “Scottish Title For Miss Watson: strong finishing run”. And the text read: “Miss L Watson (Maryhill) won the Scottish women’s cross-country title on Saturday at Bellshill. She covered the three and a half miles in 24:54 beating Miss D Greig (Tannahill), winner of the title three times, by 30 yards with Miss M Crawford (Maryhill) third, a long way back. Snow covered the course to a depth of six inches in places which made the footing unsafe. At half-distance Miss Greig and Miss Watson were together, well ahead of the field. After two and a half miles, Miss Watson running with more determination than usual, broke clear and opened up a 20 yard lead. Over the final half-mile Miss Greig reduced the margin and looked like catching up but Miss Watson, sensing the danger, produced a remarkable turn of speed. Maryhill won the team race for the fifth successive year, this time with the record total of nine points.” In the Glasgow v The Rest match, Cathie Kelly won with Lesley Watson fifth. The English championships were on 12th March and the report was much more restrained, pride of athletics place in the ‘Herald’ being given to the Scottish Schools Championships. Under the headline of Maryhill’s Team Retain Title” the two short paragraphs read: Maryhill Ladies with 90 points retained the British Women’s Cross-Country Championships on Saturday at Oxhey, Hertfordshire. The two leading performers of the team were Miss L Watson the Scottish champion who did well to finish tenth and Miss M Campbell (domiciled in Birmingham) in fourteenth position. Miss C Kelly and Miss M Crawford were twentieth and forty sixth respectively.” To date, February 2013, no other Scottish women’s club has won the British title. A summary of the team’s domestic cross-country performances over the early years is below but unfortunately not all details are known. The ‘Glasgow Herald’ archives are a great source of information for track results for men, but not quite as good for women’s events but for women’s cross-country it is not even as good as that with many races being unreported or reported in minimal detail. What is below is what can be gleaned from Ron Morrison’s site at www.salroadrunningandcrosscountrymedalists.co.ukin the archive section. No doubt the AW is better but they don’t have online archives. It can be seen however that the Maryhill LAC team dominated these championships with three first individual places, a second and four third places. 1962-’63 1st 3 M Crawford, 4 I Inwood, 5 C Kelly. 1966-’67 Bellahouston 1st 11 1 L Watson, 3 C Kelly, 7 ? 1970-’71 Dundee 2nd 36 8 M Speedman, 9 L Watson + 19? In season 1966-’67, in the club’s open races at Nether Pollock resulted in second and third for Cathie Kelly and Leslie Watson in early December, and Cathie was third the following week at Clydebank. On 9th January 1967, there were no Maryhill runners in the first three of the Scottish women’s championships at Linn Park, but on 21st January, in their own race at Pollock, second (E McPherson) and third (C Kelly) places came to the club. Into February and the business end of the season and in the cross-country handicap at Kilmarnock E McPherson was second to Dale Greig. On February 11th at Fauldhouse, the SWCCU held their combined Senior/Intermediate trial fr the international team and the winner was Mrs M Campbell-Speedman – a Maryhill LAC runner attending Dunfermline College of Physical Education. On 25th February the English Women’s Cross-Country Championships were held in Blackburn, Lancashire and Cathie Kelly was first home for the club. The ‘Herald’ report read: : “Miss P Davies (Selsonia) won the senior two and a half miles title for the third year in succession. …. She beat Miss J Smith (Barnet) by 40 yards with Miss A Smith (Mitcham) third. … First home for Scotland was Miss C Kelly (Maryhill) in twentieth place in 23:40. The other Scots finished as follows: 22. D Greig (Tannahill) 23:45, 24 Miss L Watson (Maryhill) 23:50, 31 M Purdon (Bellahouston) 24:09, 36 M Campbell Speedman (24:17), 58 M Crawford (Maryhill) 26:17 and E MacPherson (Maryhill) 28:04.” No individual polace was given for MacPherson. In the team race, Maryhill LAC was placed sixth. The very next week they were in action again in the SWCCU Championships at Bellahouston. “Miss Watson Retains Senior Title. Miss L Watson (Maryhill) retained her senior four miles title on Saturday at Bellahouston Park. She beat Miss D Greig (Tannahill) by 50 yards in 27:53 with Miss C Kelly (Maryhill) in third place. ” Mary Campbell-Speedman was sixth finisher but as a student at DCPE she was not eligible foe the club team but seventh place also went to Maryhill although the name was not given in the ‘Herald’ report. Winter 1967-’68 started with the race at Clydebank on 9th December where Lesley Watson beat Dale Greig with and M McGregor (Maryhill) in third. In the Greenock Ballot Team Relay the only Maryhill runner in the first three was third placed E MacPherson. In the handicap race held at Kilmarnock on 3rd February, Margaret Purdon (Maryhill, the former Bellahouston Harrier)) had fastest time of the day. On 17th February in the East v West Women’;s cross-country, Doreen King (Western) won from Margaret Purdon (Maryhill) who was just ahead of Cathie Kelly with both being given the same time of 26:10. On 26th February, the report on the English cross-country championship ran to a mere twelve lines and only three Scots were named – Dale Greig, Margaret McSherry and Doreen King. In the SWAAA Championships on 9th March the team result was reported as follows: “To those with only a passing knowledge of strength the victory of Western AAC in the team race came as a surprise. Maryhill Harriers, winners of the British team title three years ago, had swept the boards in the previous six years but this time had one point too many in their total for three counting runners. For Western Mrs A Lusk, who as Miss A Drummond took the individual title in 1954, 55 and 56, was second counting athlete in ninth place. Mrs G Craig’s thirteenth position gave them a total of 24 points.” Western’s first counter had been Doreen King in second. Maryhill counters had been Leslie Watson in sixth, Margaret Purdon in seventh and Cathie Kelly in eighth. 1968-’69 was the season when they took their Scottish title back again. On 25th January Mary Speedman (below), she seems to have dropped the ‘Campbell’ as far as the sportswriters were concerned, won a Three Miles race at Dunfermline organised by DCPE from Dale Greig by only two seconds. There were no Maryhill Women in the first three at Linn Park in March when Georgena Craig beat team mate Doreen King to make it a Western 1-2. 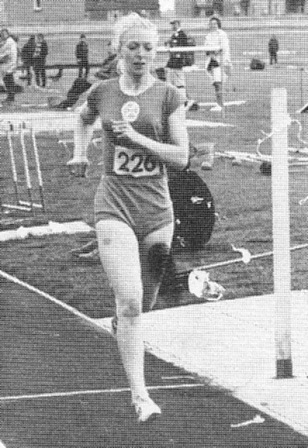 On 15th February at Clydebank Mary Speedman won the Scottish women’s championship from Margaret McSherry of Cambridge by inches: both were given the same time of 2:52. The ‘Herald’ said that it was neck and neck until the last 80 yards when Miss Speedman managed to edge out her rival by the narrowest of margins. Maryhill with their first three runners in first, third and seventh places took the team title with 13 points to Western’s 39 and Edinburgh Southern Harriers on 42 and in fourth was the Maryhill B Team with runners placed 18th, 20th and 25th. This was the last time that this team won the SWCCU Championships although they were second in the following two years (see the table above). Some team! They ran well, they won events individually and especially as a team and the question has to be how did they train? John Anderson and his coaches read all there was to read but they did not have the background in road and cross-country running that almost all of the existing men’s clubs had, so there were no pack runs such as you read about on other pages here. They trained on the track at Blairdardie at Knightswood on Tuesday and Thursday. It was quite a good venue in that it was a very big red blaes area with the track laid out but with a very big perimeter. Twice a week there and long runs at Pollock estate on the Sunday. In addition they followed the schedules that John had worked out for them and these involved road running. Several names appear in most of the teams above but when a girl is absent from the team it doesn’t mean that they were not running and backing up the team that did win. That they were good over the country is beyond dispute but how were they on the track? Let’s look at them in alphabetical order as they appear in the track rankings of the 1960’s. Margaret Crawford seems to have been an out-and-out distance runner and appeared only in the Mile rankings – in 1962 she ran 5:59.8 to be tenth in the country and in 1964 she had improved to 5:48.8 which also ranked her as tenth. Margaret won four team golds as well as three individual bronzes in the Scottish Championships. Margaret came from Blairdardie and after three third places in the SWCCU Championships plus two gold medals from the British Championships disappeared from the scene. She married a man from Greece and went to live there. Isabel Inwood with a 1945 birthdate was relatively young but was ranked thirteen times between 1961 and 1966 at 440y, 880 y and the Mile. Her best times were 59.2 (1963, ranked fourth in Scotland), 2:14.0 (1964, 2nd) and 5:20.4 (1964 1st). She also had a good record in the championships – in 1964 she was second in both 880 yards and Mile, in 1962 third in the 880 yards and again third in the 880 yards in 1963. There were also a number of District wins and good competitive races in such events as the East v West fixture. Catherine Kelly was two years older than Isabel and she too specialised in the 880 yards and one mile. I can’t find a ranking for her at the shorter distances although she did run in handicap sprints at highland gatherings at such as Gourock and Strathallan. Her best times were 2:22.8 for the 880 yards in 1966, ranked tenth, and 5:14.6 for the Mile in 1965 when she was ranked second. Her consistency over the longer distance was notable, she was ranked fifth in 1961, fifth in 1962, ninth in 1963, eighth in 1964, second in 1965, third in 1966 and third in 1967. It is also noted above that on the country four consecutive medal winning teams and had an individual bronze. Mary Campbell was another young athlete with a 1945 date of birth. From 1962 to 1966 she was very much a sprinter with times of 11.3 for the 100 yards, 25.3 for the 220 yards, 60.9 for 440 yards and with few races at 880 yards her best for this period was 2:12.6. After that spell she ran mainly 440y/400m, 800m and 1500m with best times of 59.9y/56.7m, 2:06.8m and 4:27.7m. She went on to win the SWAAA 800m twice and competed in the Commonwealth Games on the track. Lesley Watson was a key member of these teams and went on to become one the country’s best ever marathon runners – she is profiled on the website here – and her place in this very good Maryhill team cannot be overestimated. Marlyon Page (DoB 1939) was described by John Anderson as a ‘key player’ in the early days. Her contribution to the club’s success is clearly very highly rated by him. When the Williamsons moved off she was a teacher and in her early Twenties which meant that she was a bit older than most of the girls there at the time. She became the General Secretary while carrying on with her own running career. She can be found in the ranking lists as Marlyon Black and has bests of 26.6 for 220y, 61.0 for 440 yards and 2:20 for 880 yards. Jimmy Campbell who had been many things in his time including professional footballer followed his daughter Mary into the club and became one of Scotland’s finest sprint coaches. His daughter of course, was Mary Campbell-Speedman. Team spirit was of course incredibly high – it had to be to do what they did as a club. Moira Kerr was one of the country’s best ever shot putters/discus throwers and competed in the 1966 Empire Games as a shot putter but she ran in the club second team that was second in the cross-country championships! Throwers and distance running don’t usually go together but they did that day. A final note: as an indication that the club did well on the track as well as on the country, I took the Scottish statistical yearbook rankings for 1967 – selected at random from the 60’s lists that I have – and note their top performances across the board. 100 yards: Three in the top nine, five in the top seventeen; 220 yards: three in the top five, six in the top eighteen; 440 yards: four in the top fourteen; 880 yards: five in the top thirteen; Mile: thee in the top five; 80M Hurdles: three in the top five, five in the top twelve; 100M Hurdles: Two in the only four ranked; High Jump: one ranked at number three; Long Jump: three ranked in the top eight; Shot Putt: four in the top fifteen; Discus: two in the top four; Javelin: six in the top eighteen; Pentathlon: three in the top ten; 4 x 110 yards relay: Ranked first (48.5) with a Scottish National Record. The performances were listed in this fashion to illustrate that they did not achieve success with two throwers, three sprinters and a couple of milers. The club actually did produce a lot of very good athletes of their own: I recognise only one of the athletes listed above as coming from another club rather than being ‘hand reared at home’!